In this summer of marriage equality, many playwrights, no doubt, will be venturing into this territory, mining for comedy and drama and fresh insight. It is certain that few will equal or surpass the achievement of playwrights Morgan Ludlow, Alina Trowbridge and Kirk Shimano. In a series of interconnected short (around 10 minute) plays, they have avoided the pitfalls of stridency and the belaboring of the obvious, to deliver an evening of surprising variations on a theme. They have also been blessed with a fine cast of actors who get the most out of these short pieces. It is very striking that, for the most part, these pieces do not directly address the controversy about gay marriage. Rather, they pretty much assume that marriage is a given possibility for any two people without regard to gender and go on from there. In one scene, two young gay men go out on a casual date, wind up in bed, and the more romantic one admits to having fallen immediately in love. 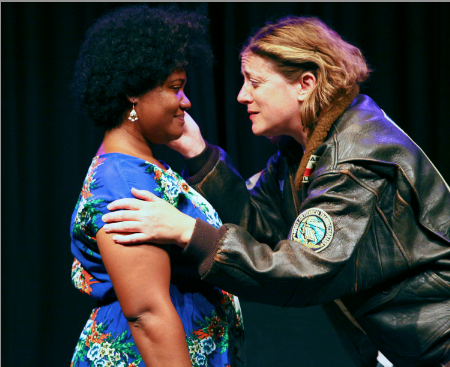 “Oh, c’mon,” replies the other, “We’re not lesbians!” This scene (credit playwright Morgan Ludlow) delights because of its radical acceptance of the situation, including the possibility of marriage, and complete indifference to specifically gay issues. The scene would play equally well with two women or a man and a woman. It’s about people, not issues. Philip Goleman and Wesley Cayabyab (who also did a fine job of directing all of the pieces) are both delightful as the young men, making consistently surprising and very playable choices. Farah Sanders (lt) and Heidi Wolff (rt) in a scene from “Lawfully Wedded”. Photo Credit: Jim Norrena. In another very impressive piece, a long-married lesbian couple discover that a close family friend is having an affair with their college-aged son, twenty years his junior. The gay marriage and the gay affair are taken for granted; the deeper emotional and generational issues get full reign. It is refreshing and effective. Both of those pieces are by Morgan Ludlow, who is the author of twelve of the fourteen scenes which make up the evening. Although all of these work adequately, they are of varying quality and the program would benefit from judicious cutting. For example, a sendup of Albee’s “Who’s Afraid of Virginia Wolfe” (“Who’s Afraid of the Big Bad Marriage”) is only mildly clever, rather long, and could easily be dispensed with, in spite of Janice Wright’s very funny take on Martha (here renamed Harriet). Kirk Shimano’s bit of farce, “Chris and Sean and Chris and Shawn” involving two brothers (one gay, one not) and a lot of nonsense with names and confused identities is very entertaining. Jeffrey Orth is especially funny as “The Marryin’ Man” whose opinions on gay marriage must change depending in which state his movable chapel-in-a-trailer is parked. In “Double-Edged Sword” by Alina Trowbridge, two middle-aged lesbians, legally married for many years, prepare for their divorce. It works beautifully because it is about marriage, period, not “gay marriage”. Though overlong and in need of judicious cutting, “Lawfully Wedded” offers a pleasant night at the theatre overall, with some surprisingly effective moments, excellent writing and fine acting. “Lawfully Wedded: Plays About Marriage” by Morgan Ludlow, Alina Trowbridge and Kirk Shimano. Produced by Wily West. Director: Wes Cayabyab. Lead design: Quinn Whitaker. Actors (in various roles): Wesley Cayabyab, Philip Goleman, Kat Kneisel, Brian Martin, Jeffrey Orth, Scott Ragle, Farah Sanders, Heidi Wolff, and Janice Wright.